Rakhsha Bandhan is here, it’s time to impress everyone with your culinary skills. You can try your hand at Indian sweets like Phirni or Badam ka Halwa or you can make chocolates which are a favorite for young and old. Handmade chocolates beautifully packed in colorful foils are best gift a brother can give to his sister. Packaged in baskets with bow and voila you have a special and unique gift for your sister. So here is a simple recipe for all the mothers to make chocolates at home. There are numerous ways and methods to prepare homemade chocolates but the best and simplest one is to prepare with the help of a chocolate syrup method! Sieve the milk powder and cocoa powder together. Keep it aside. Heat water and add sugar to boil and caramelize it. Lower the flame and continue stirring the sugar syrup for even consistency. Into the caramelized sugar add butter and mix well till it melts. Remove it from the flame. Once off the flame add the powdered mix of milk and cocoa powder into the caramelized sugar. Mix well till it gets glossy and starts leaving the sides of the vessel. Grease a square pan or plate with oil or butter and pour the mixture into the pan. Pat down the pan until it sets smoothly. Let it be there for 10 to 15 minutes at the room temperature. Wait for 15 minutes; refrigerate the chocolates for One hour. Cut the chocolates in any shape you like. I usually use a cookie cutter for this. You can add crushed cashew nuts, pistachios, pecans, raisins and almonds before poring the mixture onto the pan to give a nutty flavor to your handmade chocolates. You can also add 1/2 tsp of vanilla essence at the time of adding butter. Vanilla essence will add flavor to your chocolates. You can experiment with flavors like chocolate essence, cinnamon or espresso as well. If you have kids at your home then you can use different molds, ice cube trays, bowls to get different chocolate shapes. Kids will definitely love eating chocolates presented in different shapes. Alternately, you can also roll the finished chocolate in desiccated coconut or colored sprinkles to give it a different flavor and look. 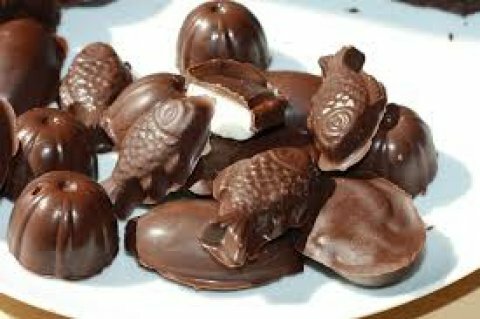 From this time onward when ever it comes to gifting chocolates, don`t rush to nearby store to pick up a bar or chocolate gift pack, instead make your own home made chocolate.